A croissant is a buttery flaky bread named for its distinctive crescent shape. It is also sometimes called a Crescent. Croissants are made of a leavened variant of puff pastry. The yeast dough is layered with butter, rolled and folded several times in succession, then rolled into a sheet, a technique called laminating. The most difficult part of making croissants is that they take a veeeeery long time. About 12 hours total, with resting and rising periods. 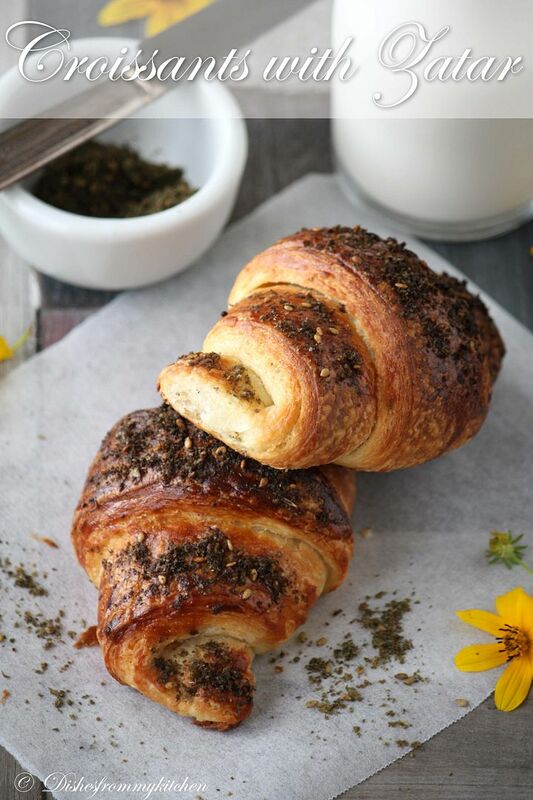 I made few plain croissants and other sprinkled with Za'atar(Zatar) middle eastern spice...yummm... here you go for virtual treat. 2. Measure out the other ingredients. 3. Heat the milk until tepid (either in the microwave or a saucepan), and dissolve in the salt and remaining sugar. 13. Fold the dough rectangle in three, like a letter (fold the top third down, and then the bottom third up). 34. Fold in three, as before. 37. It’s now time to cut the dough and shape the croissants. 38. First, lightly butter your baking sheet so that it is ready. 39. Take the dough out of the fridge and let it rest for ten minutes on the lightly floured board or counter. 41. Cut the dough into two rectangles (each 10 by 5 inches (25½ cm by 12½ cm)). 42. Place one of the rectangles in the fridge, to keep the butter cold. 44. Cut the rectangle into three squares (each 5 by 5 inches (12½ cm by 12½ cm)). 45. Place two of the squares in the fridge. 46. The remaining square may have shrunk up a little bit in the meantime. Roll it out again till it is nearly square. 50. Place the unbaked croissant on the baking sheet. 54. Mix the egg with a teaspoon of water. 56. Put the croissants in the oven for 12 to 15 minutes, until the tops are browned nicely. Your Croissants are gorgeous! And your photography is pro! Love the idea of zatar, fabulous job! 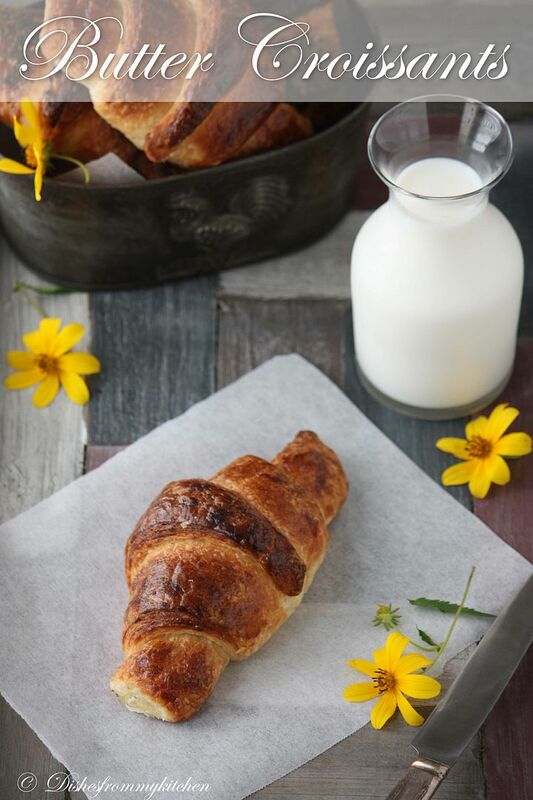 Omg, those flaky and super inviting croissants looks damn divine..
Crispy crust n soft inside.. Lovely croissants..
Wow Wow Wow... so beautifully done in a perfect professional way! perfect croissants!! lovely click pavi! 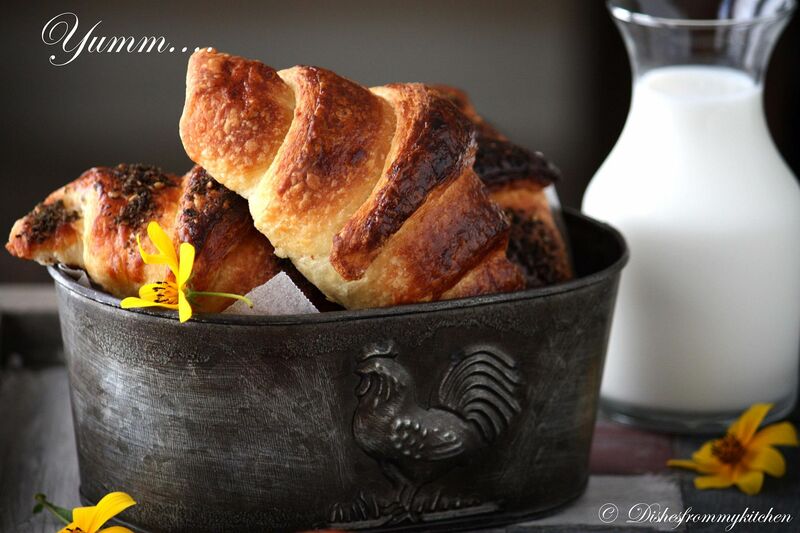 Lovely croissants Pavithra.......You nailed it with the pics girl......awesome awesome. 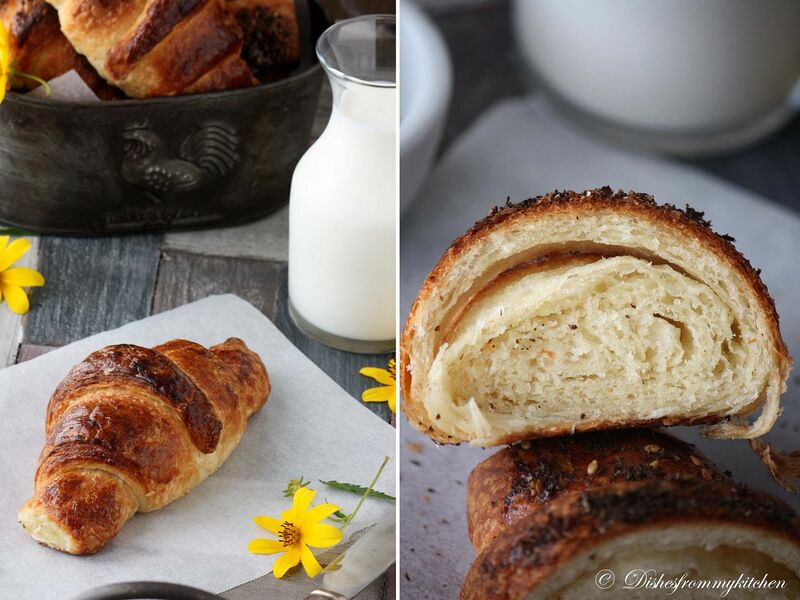 The thought of baking croissants is truly daunting, yours look fabulous Pavithra! Loved the pictures! Lovely clicks and loved the rooster tin :). It looks great! Y do u place same pictures twice in the post. I think most of the post do have this! @ Anonymous is it bothering you ??? Looks so perfect!!! Lovely clicks.. look so inviting!! Lovely clicks... And the croissant looks great too..
@ Anonymous I know what I do and the people and friends know what I do. You don't need to poke into my business. If you are really concerned about what I am doing then you should not disguise yourself as anonymous and reveal who you are. Try to appreciate what people do and the effort they take to produce each and every post. For people like who don't realize all these don't need to comment. This is my personal space, I can post pictures the way I like. To start my day with croisant liek this..everything will be ok:) It looks amazing.I know it requiers patience and time to get the pastry right and it looks like you mastered it! Just loved all your pictures! Hugs! 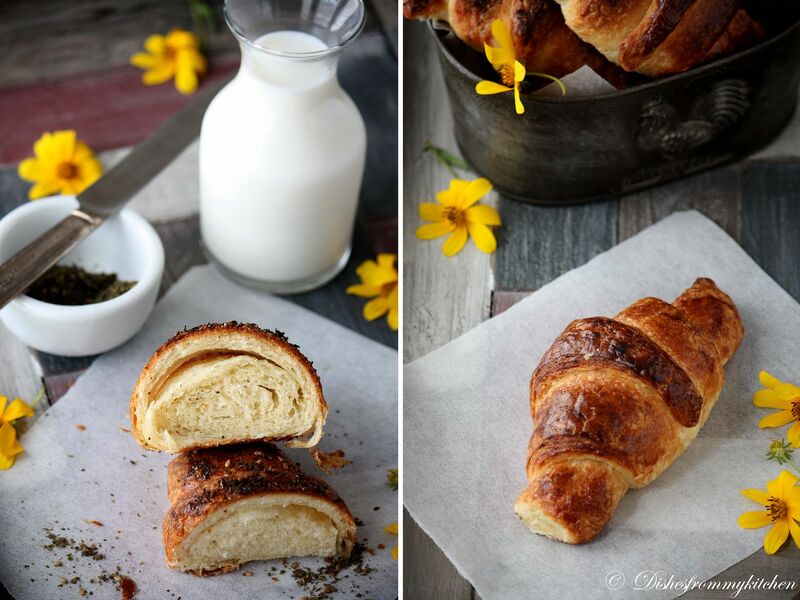 Beautiful pictures and the croissants with zatar sound fabulous, great job! It was indeed a wonderful visual treat.Croissants look perfect. Zaatar sprinkle is such a unique & new idea..so savory & flavorful...wish I would be able to recreate your recipe some day...loving all the pictures..have a great week ahead! Seriously gorgeous croissants. Amazing job. Stunning, stunning, stunning! Nice job on the challenge! 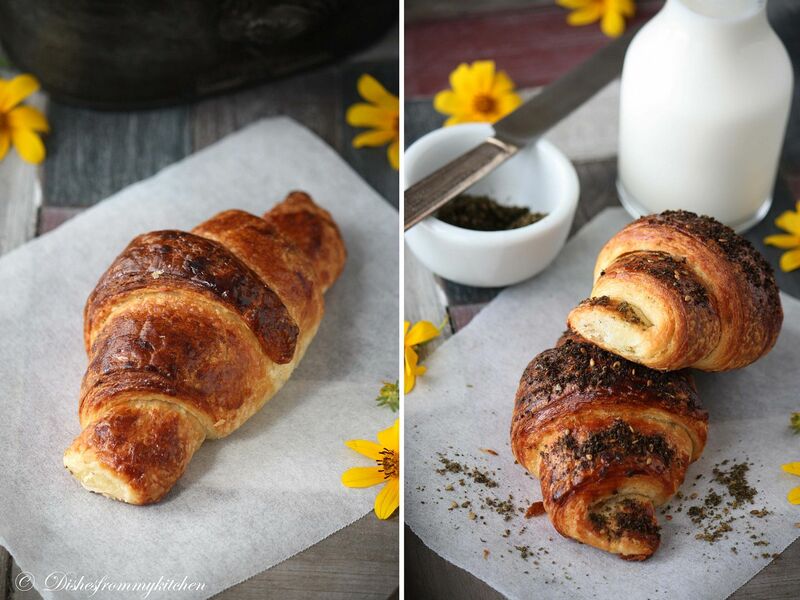 Great job...croissants looks perfect and yummy....as usual stunning photographs. Those beauties are stunning the colour is perfect. A marvellous result. Bravo to you. I love the herb croissants. Cheers from Audax in Sydney Australia. Great job on your croissants! They look wonderful! 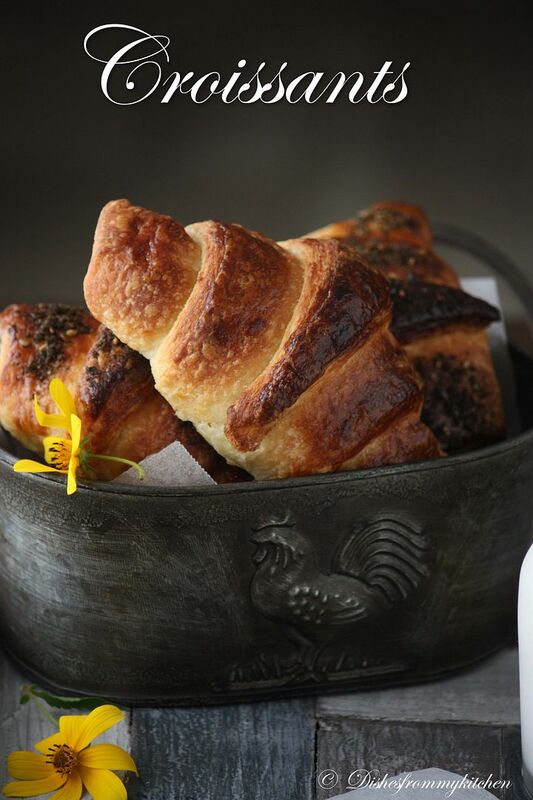 Appealing and pleasing croissant to enjoy pavi. Simply delicious. lovely and awesome pics...........love ur blog for it. Uve done an amazing job, the croissants look amazing!! Appealing croissants!!! craving for some... salivating here :) lovely clicks!! really love the photos, such a nice blog. I love croissants very much,yours looks absolutely yummy! loved the props you have used too. Flakky, Fluffy , Fresh, Fantastic !!! I specially love the first picture on the post !! You have a lovely space here. A small tip from a Lebanese: Zaatar is commonly used in Lebanon for breakfast dishes. 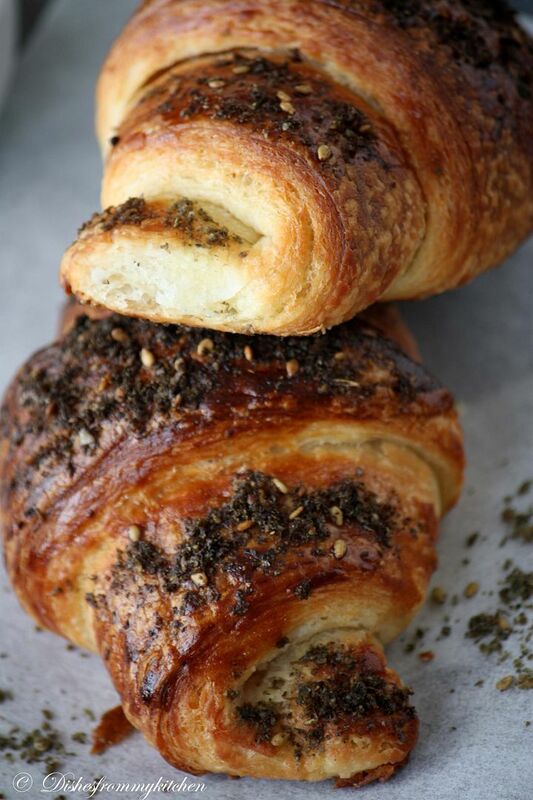 We usually put the Zaatar inside the croissant rather than outside. It keeps the zaatar from falling out, and from burning in the over. 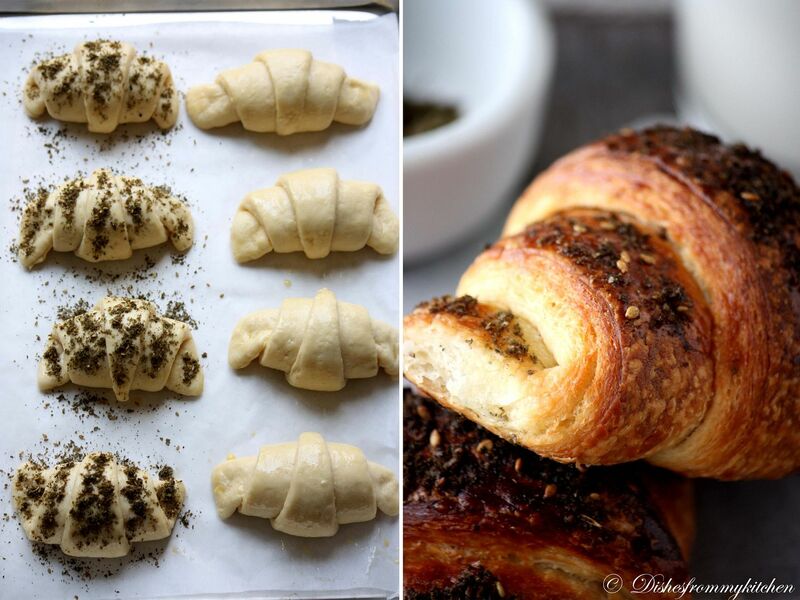 We do the same trick with Cheese Croissant and Chocolate Croissants. Thanks for the recipe, I will try it soon. @ Rasha Thanks for your sweet comment and tip. It was my last minute plan to sprinkle zaatar so i missed to put inside. I will surely follow your tip next time when i make this. Thanks again. Both your version looks very yummy! Stunning pictures. What a great idea to include Zatar! Wonderful job on the challenge! Oh wow I can imagine how delicious this would make the buttery crosissants..I love it! !